Police said a Chevy Tahoe sport-utility vehicle was driving on the wrong side of a two-lane stretch of Route 3 when it struck the Toyota Corolla about 2:50 a.m.
Just based on the facts in the Post article, we can say, "A 29 year old man was driving his Chevy Tahoe SUV on the wrong side of Route 3 early yesterday when he struck and killed four people in a Toyota Corolla." Why can't the printing press at the Washington Post say that? Close reading of Alpert's post suggests that he may know what passive voice means, unlike most of the contemporary intellectuals who complain about it (e.g. Nancy Franklin in the 3/23/2009 issue of the New Yorker, discussed here, or the bloggers discussed here, here and here). At least, in two out of three cases where Alpert specifically complains about the passive voice, there is actually a passive-voice construction somewhere in evidence. Many fields use too much passive voice. MRI reports, for example, read like this: "Mild Straightening of the cervical lordosis is demonstrated. Mild mucosal thickening is incidentally noted at the floor of the sphenoid sinuses." The straightening didn't observe itself. The doctor observed it. Why not just say that on the report? In a study, [Ian Walker of the University of Bath in England] had subjects look at various photographs of traffic and describe what was going on. When subjects saw a photograph with a car, they were more likely to refer to the photo's subject as a thing. When subjects looked at a picture that showed a pedestrian or a cyclist, they were more likely to use language that described a person. [O]ur habit of dehumanizing the actions of cars tends to create assumptions that their actions are not actually someone's responsibility. A driver hit and killed some people in another car in Culpeper. It's extremely unlikely his car magically malfunctioned. And even if it did, we don't engage in the same linguistic contortions to say, for example, that a police officer's bullet impacted a suspected robber, who had himself been holding a gun which fired into someone else earlier in the day. That would be silly. So is this. But choosing whether to say that someone was killed by a driver or a car or a collision — or by a shooter or a gun or a bullet — is not a choice of active or passive voice, it's a choice about how to attribute agency, as well as a choice about how to focus a description. Cooney said Milligan called police at about 7:30 p.m. Thursday to report his gun had discharged. Milligan told investigators that he invited Getting into his apartment to see his gun collection, Cooney said. During the visit, Milligan handed Getting the gun, which Milligan recently purchased, and it discharged, Cooney said. In his opening argument, assistant attorney general Kevin Zoellner said Sgt. Carl Dewayne Graham Jr. was ambushed in his driveway March 20, 2005, after completing his shift for the day. Graham was shot in the back with a high-powered rifle and suffered a skull fracture when he fell backward from the impact. The bullet severed his spine, Zoellner said. "A coward shot him in the back," Zoellner said, then with a shotgun pumped two shots into his head, peppering Graham's face with shotgun pellets. "His name is Lance Shockley and he's sitting here," Zoellner said, pointing to Shockley, who wore a blue dress shirt and brown slacks, seated between his defense team. A truck’s brakes stopped working at Corredor Norte, near the San Miguelito entrance, colliding with two cars on Saturday [-responsibility, +personification, -passive]. One of the cars was carrying three adults and one child [-responsibility, +personification, -passive]. Both the truck and the car instantly caught fire, killing all of the car’s passengers [-responsibility, +personification, -passive]. The truck was driven by Joseph Nataniel Donalson, currently under police investigation [+responsibility, -personification, +passive]. A 67-year-old visitor from Alaska died Friday [-responsibility, -personification, -passive] after being involved in a two-vehicle collision on Akoni Pule Highway [-responsibility, -personification, +passive]. … officers determined that the victim was operating a 2008 Mercury four-door sedan and traveling north on Akoni Pule Highway when he ran off the right side of the road, struck a guardrail, crossed the centerline and collided into a 2006 Chevrolet bus traveling south [+responsibility, -personification, -passive] … Police are going to wait for the results of the autopsy to see if the victim died from a medical condition or from injuries in the crash before counting this death as a traffic fatality. Mr. Alpert presumably believes that that civic virtue would be increased if the caption for the picture below, instead of being "Two vehicles collided head-on Saturday afternoon near Stansbury in Tooele County, claiming the lives of three people and injuring a fourth", were — what? Based on the accompanying story, maybe his prescription would be "By falling asleep at the wheel, Jacob Ryan White was said to have caused this head-on collision, claiming the lives of three other people and injuring himself" — even though the original caption was entirely in the active voice, and the main verb of the proposed substitution is passive. I'm not sure whether Alpert is right about the value of publicly naming and shaming drivers with various levels of apparent culpability for serious collisions. But either way, I'm positive that this has nothing whatever to do with the unjustly maligned passive voice. In your last quote, if the authorities are still trying to determine the cause of death (and specifically, whether or not death behind the wheel may have caused the accident), why does it say in the first sentence that the 67-year-old died *after* being involved in the accident? That seems to be jumping the gun. And if his or her driving may have caused the accident, why is he or she referred to as the "victim"? I like the ironic parody of newspaper headline style (including use of the passive voice) in the title of Alpert's post. He predicted correctly that driver's insurance would shift from the existing fault-liability basis (the other guy's insurance pays for your losses) to a no-fault basis (your insurance company pays) as a result of this shift in thinking. "A 29 year old man was driving his Chevy Tahoe SUV on the wrong side of Route 3 early yesterday when he struck and killed four people in a Toyota Corolla." Why can't the printing press at the Washington Post say that? Because this sentence is about the driver, not the accident or the victims. It gives the impression that the man suddenly and deliberately struck and killed the people, and that the means or striking and killing could have been something other than his car. Surely the relatives of the dead passengers are not primarily interested in the age of the man, the type of his vehicle and other particulars. @John Cowan: What shift in insurance? I've been in 3 auto accidents where my insurance has paid for the other guy's losses. Not that I felt that I had necessarily caused them by my own agency, but I was at fault to a degree, and the other drivers were not at all. The newspaper style of not discussing human agency in car accidents strikes me as mirroring informal conversation. I think it's more common to hear that a car cut someone off, ran a red light, or hit a pedestrian than that a driver did it. Isn't it normal to say–in passive voice–my dog got run over by a car? I'll also note that stealing a car for the hell of it is called 'joyriding', not 'joydriving'. There certainly does seem to be a pattern of denying the agency of the drivers of cars. Remember all that "innocent until proven guilty" stuff you learned in civics class? The journalist doesn't actually *know* beyond a shadow of a doubt that the guy currently in custody is actually the responsible party. What the journalist knows is that four people were killed, and that police have identified a suspect. Passive voice is one of several useful tools that the journalist can use in order to report the news accurately, without seeming to make biased judgment calls or violating a suspect's right to trial. A defense lawyer might be able to convince a judge that local news coverage reporting "Mr. John Doe killed four people last night" unfairly biased the jury pool, which might lead to higher court throwing out a conviction. Most journalists would far rather face the wrath of the anti-passive grammar mavens. Yes, there are ways to avoid both bias *and* passives, but most of these traffic reports are written on short notice, with only the sketchiest of details (pulled, perhaps, from passive-riddled police reports). In a day or so, there will be a longer and better-written article, drawing from interviews and eyewitness reports. Yesterday my dog was run over by a driver. It would have been worse if the driver had been in his car at the time. @dw: Is Alpert being ironic still by saying "Why can't the printing press at the Washington Post say that?" He's either ironically dehumanizing Martin Weil (at the same time "humanizing" printing presses) or he just doesn't follow his own advice. He links to a web page, so I don't have any evidence that the printing press actually "said" those words. I think this article raises an even bigger Research Question: Why do we always call the things we perform experiments on the subjects? Why isn't all that paperwork there to let us study Human Objects? Even the most cursory study of requested revisions to research protocols would show that it can't be due to administrative yen for euphony. At least, I don't think it would. I haven't been able to work out how to apply for clearance to study this phenomenon. > John Cowan : in French, the word 'accident' means any encounter of a vehicle with an obstacle, even due to negligence or even purposeful act. Isn't it the same in English ? Insurance companies then differenciate 'accident en droit' from 'accident en tort', but 'accident' it always is. Also, did nobody bat an eyelid on reading about a vehicle driving ? I've always found the accident terminology rather comical. When I was a teenager, I would often find my vehicle filled with unruly passengers. Sometimes, I threatened to get into an on-purpose if they didn't settle down, which I promised would be many times worse than an accident. 1. a. An occurrence, incident, event. Obs. b. Anything that happens without foresight or expectation; an unusual event, which proceeds from some unknown cause, or is an unusual effect of a known cause; a casualty, a contingency. the chapter of accidents: the unforeseen course of events. c. esp. An unfortunate event, a disaster, a mishap. But it has no quotes later than 1882 for this. I don't think Alpert's appeal to Vanderbilt evinces any ignorance of the grammatical definition of "passive voice", though Prof Liberman argues convincingly that it presupposes an incorrect theory of the passive's semantic function. did nobody bat an eyelid on reading about a vehicle driving? This may well have influenced Alpert's reaction to the text. If this is considered an error, the fix would of course be to make it passive: "Police said a Chevy Tahoe sport-utility vehicle was being driven on the wrong side of a two-lane stretch of Route 3 when it struck the Toyota Corolla about 2:50 a.m."
"between his defense team" caught my attention. "there is a complex relationship, at best, among the attribution of moral responsibility, the description of events where inaniminate objects act to some extent under the control of humans, and choice of passive vs. active voice." And of all the things that are wrong in this world to rant about, the way a newspaper juggles these factors in telling this sad story isn't one of them. Marie-Lucie is right: The first sentence of the article gets across the important fact, namely, the deaths of four people, properly and effectively using the passive to focus on what happened to the victims. So, what we need is a snappy, easily understood term that describes ambiguous agency, so that usage mavens and dilettantes can use it instead, and leave "passive voice" to the grammarians and linguists. Suggested > "A 29 year old man was driving his Chevy Tahoe SUV on the wrong side of Route 3 early yesterday when he struck and killed four people in a Toyota Corolla." Why can't the printing press at the Washington Post say that? Even better: "A 29 year old man driving his Chevy Tahoe SUV on the wrong side of Route 3 early yesterday struck and killed four people in a Toyota Corolla." A principle of journalism is to get the most important fact as close to the beginning of the story as possible. In the first example that is the death of four people. As composed by Martin Weil, we learn that by word eleven. In Alpert's suggested rewrite, it takes 27 words to get there. Yeah, I think marie-lucie and Bill Walderman are right — the lede was better as written. It's a good example of a case where the passive is exactly what you want. One of the uses of passive is also to promote the "object" to "subject" when it is, in fact, *more important*: John was hit by a bus, not A bus hit John. Or the famous question "Was you ever bit by a dead bee?" Putting the dead people into the subject slot of a passive-voice sentence gives them more importance than making them the direct objects. "'A coward shot him in the back,' Zoellner said, then with a shotgun pumped two shots into his head, peppering Graham's face with shotgun pellets." To me, that's a poorly-constructed bit of news-speak. Not that there's anything inherently wrong with using part of a direct quote, then paraphrasing the rest. But, in this case, it sounds like Zoellner said those words, then started shooting. 1) Four people were killed. That's the main story, that fact goes first. 2) Journalists are taught never to attribute agency in a traffic accident. There could be all sorts of reasons beyond the control of the other driver for his car being on the wrong ide of the road. Incidentally, would Alpert have complained if the story had begun: "Four people died …" rather than "Four people were killed …"? "Journalists are taught never to attribute agency in a traffic accident. There could be all sorts of reasons beyond the control of the other driver for his car being on the wrong side of the road." The assumption of the person who originally complained about the use of the passive was that the driver on the wrong side of the road was drunk. That may well be true, but another sound reason for the journalist to begin the story by stating the central fact, using the passive and avoiding an attribution of responsibility, is that it's entirely possible that the driver of the other car, out on the road at 2 am with three other young people, could have avoided the accident if he or she hadn't been drunk, too. "A guardrail struck a car this morning …"
@mollymooly: indeed, i think our host has completely misinterpreted the section of the article quoting Tom Vanderbilt: i see no indication that vanderbilt is being accused of and criticized for excessive use of the passive. rather, the passage seems to be being quoted in order to make the point about dehumanization of cars. Are we talking about "dehumanization" of cars (which have never been human) or "humanization" (= "anthropomorphization") of them? I think that "a car was driving" and similar instances occur because unless we are very close to a car, and the car is either motionless or not going much faster than we are, we can see a car and observe its motions from a distance without being able to identify or even see the driver. Similarly, from a distance we can say "the plane just landed" but we would have to be in the cockpit to be able to specify "the co-pilot landed the plane". It seems to me that there is exaggerated emphasis on the presence or absence of a responsible agent ("the perp") when the "by" phrase is made a typical component of a passive sentence (as in Chomskyan theory). Many languages have a passive form without having a "by" construction: in such languages one says for instance "X was injured, it was Y who did it" (if Y is known or relevant). But the word "agency" is too focused on conscious, presumably aware agents. For instance, it sometimes happens that cars are crushed by falling trees or rocks, or that children are made very sick by liquids such as cleaning products, or under other circumstances where there is no suggestion that a living, conscious agent was involved. Unless you are an animist, such causes of accidents cannot be considered "agents". And as someone remarked earlier, the complements of a passive verb can be quite other than a "by" phrase, as in "The book was written in 1894/in New York/while the author was recovering from a broken leg/etc, but it was not published until fifty years later/etc." @marie-lucie: oops, thinko on my part. should have been either "humanization of cars" or "dehumanization of drivers"
When I think of passive constructions, academic papers seem to be the first to come to mind. This probably has to do with the fact that I am still a student. However, I was taught at an early age that the passive construction is a no-no when you are writing formal papers. Yet it is really interesting to see and think about all of the different places that the passive can show up. In these cases, newspapers. I agree that the choice to use or not use the passive has to do more with whether the writer wants his or her readers to focus on the actual occurrence or the agency of the person who was responsible or involved in the occurrence. All of the examples that were given were excerpts that you could read anywhere. I know I have read numerous accounts of accidents and never thought twice about its grammatical construction, but after reading this posting, I am noticing the passive/active constructions. I think as reporters, these professional writers would not have any trouble with grammar or grammar rules and any digressions they make from these rules would be somewhat deliberate. In most cases, it seems safe to assume that the use of passive or active voice really has to do with how they want to focus the story and where they want the agency to fall. Yet I do feel that the whole observation that in car accidents cars tend to receive the agency while in shootings the bullet not the shooter tends to receive agency, is ridiculous. Is the car driving itself? Does the bullet have a mind of its own and therefore chooses its own target? These are ridiculous ideas and I think writers really have to keep in mind how they are presenting the story to their readers. In instances where people are responsible they must be given the responsibility of their actions and if this is accomplished through the active voice, then so be it. Also, I feel writers are responsible for bringing the real story to people and therefore they should once again keep in mind how they are writing because that affects how their readers perceive the information. Diane Chung: …Yet I do feel that the whole observation that in car accidents cars tend to receive the agency while in shootings the bullet not the shooter tends to receive agency, is ridiculous. Is the car driving itself? Does the bullet have a mind of its own and therefore chooses its own target? On the contrary, the distinction is better than you'd expect casual journalists to make, for in almost every case a bullet slays a human, the person holding the gun willed to do precisely that, while in almost every case when a motor vehicle takes a life, the car did an awful unintended thing. If someone is shot with a handgun, any witnesses will see the person holding the gun (although in the case of a sniper, or during combat or bombing, a bullet or bomb might arrive without the person shooting it being identifiable or even seen). A person can be killed "by a stray bullet", or "by friendly fire" or "by an explosion", rather than by a specific person, but that does not mean that the bullet, etc is thought to be "responsible": it is the means, not the agent. If someone is injured in a car accident, as I mentioned earlier the driver of the car might not be identifiable by a witness either, simply from being inside the car, while the car itself can be seen from quite a distance. When the police or ambulance arrive on the scene of a vehicle accident, the first thing they do is look after any injured persons, not try to determine who might be at fault. 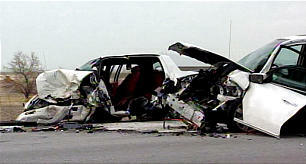 It is quite common for investigators to conclude that the driver lost control of the vehicle (not just because of drinking: the road could be covered in ice, whether visible or not, or there might be some other factor such as vehicle malfunction), or the driver suddenly braked or swerved to avoid another vehicle or an animal on the road, etc. It is just simplistic to want to rewrite every passive sentence so as to assign "responsibility" to a "perp". Merri: I think that accident in English, outside the realm of vehicles, carries the implication that neither intent nor negligence is present. I think French accident would better be rendered 'incident' in such a case.